The Dodgers lack luster so far, and it shows in the way they start the game. The Dodgers have scored only 25 runs in the first inning. Only San Diego, among National League clubs, has fewer runs to show for the first frame. 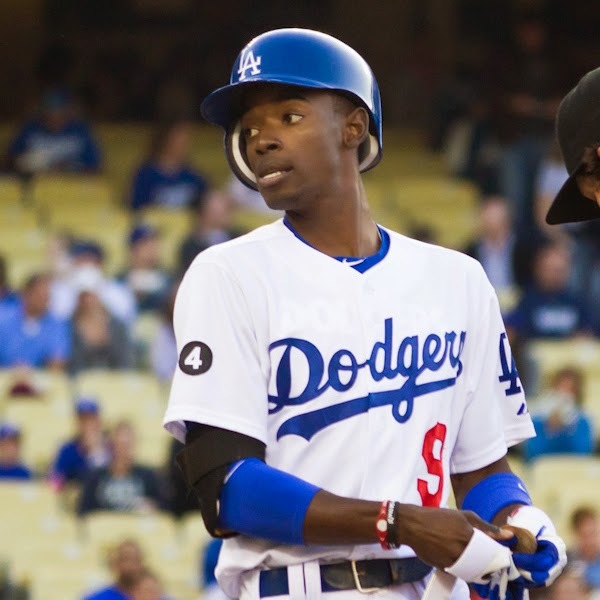 Dee Gordon has made many contributions this season for the Dodgers, but he's still not getting the offense started in the first inning (bridgetds/Creative Commons Attribution 2.0 Generic license). Those arriving so late as to miss the first inning at Dodger Stadium aren't seeing nothing happening. Nothing happening is the Dodgers offense in the first inning, specifically at home. Across baseball through the years, the first inning is the best inning for scoring, but it's one of the worst this year for the Dodgers. Entering a six-game homestand on June 13, they've scored only 25 first-inning runs all season, the second-lowest total in the National League. Only the San Diego Padres, with 20, are less successful. If you're able to see the road games because you're able to see the Dodgers on TV, you might not notice it as much. The Dodgers are about like a normal club in the first inning on the road, scoring in the first inning 11 times for a total of 17 runs (they're 8-3 in those games). The average Major League club has scored 31.8 runs in the first inning this year (home and road), so the Dodgers are close to the average just as a road team. At home, the Dodgers have scored only six times in the first inning, totaling eight runs (They're 2-4 in those games.). When you look at the Dodgers having the second-worst home record in the league at 13-19, it would seem that failing to score in the first inning 26 times has something to do with it. In 32 home games, the Dodgers have scored three runs or fewer 16 times. They have won one of those games. They have scored two or fewer at home 11 times, and won none of those games. They've scored one run six times, but they've been shut out once. Dodgers manager Don Mattingly suggested in The Los Angeles Times Friday morning that the expanded and refurbished clubhouse at Dodger Stadium might influence how badly the Dodgers are performing at home. That's an intuition and we'll leave that with the Dodgers. What really pops the eye is the numbers for their offensive performers in the first inning, when they emerge from the clubhouse. Put Dee Gordon in the road greys and he's a snappy player, batting .296 with a .355 on-base percentage. Even at home, he's .274 and .306. But in the first inning, Gordon remains overmatched, going .265 and .294. Gordon has the third most first-inning plate appearances for the Dodgers (51), all at the top of the lineup, and he has scored only five runs. One of those was a solo homer. But the problem isn't merely that Gordon doesn't get on to create first-inning opportunities, for he can at least boast the third-best batting average for the inning of any Dodgers hitter (with at least 10 first-inning plate appearances). Most of the hitters down the order are even worse. Hanley Ramirez is a .240 hitter with a .725 OPS in the first inning (58 plate appearances, most on the club.). Andre Ethier is three-for-26 (.188) with one walk, four strikeouts and two RBI in the first inning. It's no secret that Matt Kemp isn't what he used to be, especially in the first inning. During his should-have-been-MVP season of 2011, he slashed .383/.445/.798/1.243 in the first inning. All of those were his highs for an inning, except for a .455 on-base percentage in the eighth. His first inning runs (23), homers (11) and RBI (36) were his highs for an inning. This year, his first inning is two-for-15 (.133) with no walks and three strikeouts. He has reached base twice, but also grounded into three double plays, so he has a negative output concerning base runners in the first inning. Not to suggest a correlation, but Kemp's work against left-handed pitching has fallen off the same way. The Dodgers have been turned out by left-handers for at least three years, but Kemp once gave them one guy who could tear lefties apart so badly that they were going to score, anyway. In 2011, he split .341/.461/.682/1.142 against left-handers, with 11 homers and 32 RBI in 132 at-bats, 30 walks and 29 strikeouts. In 2014 against left-handers, Kemp is .176/.211/.294/.505 with no homers and five RBI in 68 at-bats, three walks and 18 strikeouts. He is literally less than half the hitter he used to be against left-handers. This year, the Dodgers are batting .213 with a .644 OPS against left-handers, each being better than only the Padres in the NL. Their batting average on balls in play (.260) is barely better than the Padres at a bottom-ranking .259. But the Dodgers do two things reasonably well against left-handers, and they count: they walk and they can occasionally run into a left-hander and take him out of the park (16 homers). None of those are balls batted into play. The homers make the Dodgers about average in the NL. The benefit is multiplied, however, because the Dodgers have walked 62 times against 606 plate appearances, the second-highest such proportion in the league against left-handers. So, they are seventh in runs against left-handers (66), though also third in plate appearances (682). Most of their damage to left-handers comes from the right side, naturally, and especially from Scott Van Slyke, who has six homers in 44 at-bats and a 1.243 OPS against left-handers. As far as how the Dodgers' left-handed hitters do against left-handed pitching, Clayton Kershaw is about as good as any of them. We got sidetracked just now and began looking at how badly the Dodgers handle left-handers as the discussion got into Kemp. This is supposed to be about how the Dodgers score fewer runs in the first inning than all but one other club in the National League. We don't suggest any kind of cause and effect between the two. We can't even imagine which would be the cause and which would be the effect. We know, also, that struggling against left-handers is a long-term trait of the Dodgers, while we suppose that the first-inning problem will work itself out in the long run of cases this season. The numbers are too weird to believe right now. The Dodgers, as said before, are 15th in the NL with 25 runs in the first inning. But seven American League teams have scored fewer first-inning runs than the Dodgers, and two of them are the Boston Red Sox (24) and Detroit Tigers (23). Can we really expect it to end this way? The Red Sox pounced on everyone at the start last year, but their first inning this year reeks of Dustin Pedrioa (.619 OPS in the first inning) and David Ortiz (.631). For the Tigers, Miguel Cabrera is relatively lacking luster with his first-inning OPS of .843, and Victor Martinez is less than that at .669. But along with that, Ian Kinsler (.514) and Torii Hunter (.483) are next to nothing in the first inning. Allowing that Hunter may be finally showing his age at 39, it's hard to believe that all these elite players between the Dodgers, Red Sox and Tigers are going to continue stammering through the first inning. With about 100 games left in the season, it's early enough to believe that these hitters will work it out. The Dodgers have a couple hitters somewhat delivering in the first inning. Adrian Gonzalez has a .286 batting average and an .897 OPS, while Yasiel Puig has a .298 batting average and .888 OPS. But neither of those are sky high, and they're not enough to paper over all the other weak first-inning performers. It should be mentioned that the Dodgers have a ninth-inning problem, as well, and it is serious. They are second from the bottom across baseball in ninth-inning batting average (.174) and OPS (.508). The average team has scored 22.6 ninth-inning runs and the Dodgers have scored 15. They have no one hitting in the ninth. The most culpable by OPS are Gordon (.649), Carl Crawford (.481), Ethier (.478), Van Slyke (.465), Puig (.440), Gonzalez (.269) and Kemp (.241). It would seem that the Dodgers struggle against the top relievers. The ninth inning and the first inning are different problems. The first inning is never a do-or-die situation, but it always counts and it is the best opportunity for arranging offensive talent to strike against a pitcher who hasn't gotten into his tool box. That's why the first inning is the highest scoring inning. The ninth inning may or may not be crucial. If some team gets well enough on top, it isn't. The Dodgers are flat-lining at 35-33 this year, and one reason is that they can't get on top of a game at Dodger Stadium. They seldom score in the first inning at home and, even when they do, they've still lost two-thirds of the time. The probability gremlins discourage a flat prediction that the Dodgers will ultimately reach their level in the first inning. But the Dodgers certainly are paying enough bats to do it. The hot streak we're waiting for could ride on it.